These healthy Slow Cooker meatballs are veggie-packed and great for an easy, kid-friendly dinner. You can also make them in the Instant Pot! Serve them over noodles, on a sub bun or enjoy them plain! 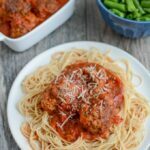 I originally shared this recipe right before Squish was born, after I did a little reader survey and you guys asked for more slow cooker recipes. Fast forward three years, I did another survey and guess what? I still make these every few weeks and you guys are still asking for more slow cooker recipes. So I’m resharing this recipe with a few updates (ie adding more veggies) and I also tested them in the Instant Pot so I could give you guys directions for that as well. There is nothing super fancy about this recipe. It’s basically just meatballs, except they’re cooked in the crockpot so it’s hands off once you get them in there. I also added some extra veggies because that’s never a bad idea! Once they’re cooked you can serve them over spaghetti, on a bun for a meatball sub, or eat them with just the sauce! These Crockpot meatballs can be made in the slow cooker or Instant Pot for an easy, healthy dinner. Serve them over noodles, on a sub bun or enjoy them plain! Combine all ingredients except carrots, peppers and tomato sauce in a large bowl. In a hot, well-oiled pan on the stove (or using the saute function on the Instant Pot- make sure you have a thin layer of oil covering the bottom of the IP & be sure to leave the lid off), brown the meatballs on all sides. You may need to do this in batches. If using the crockpot, add browned meatballs, plus shredded carrots and peppers and sauce to the slow cooker, cover and cook on low 4-6 hours. If using the Instant Pot, remove all the browned meatballs, add a tiny bit of water or broth and scrape up any large brown bits that are stuck to the bottom of the pan. Add sauce and shredded veggies, then add meatballs and stir to combine. Use the manual (or pressure cook) button and cook for 10 minutes. 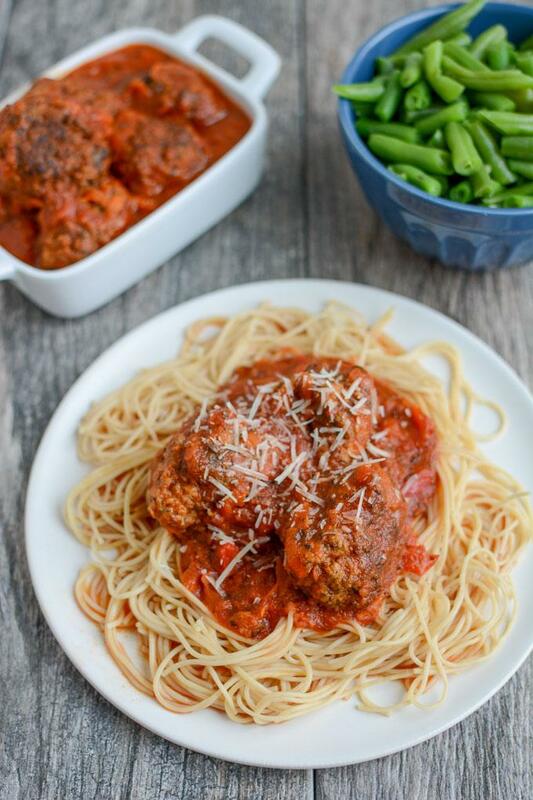 Use the quick release and check to make sure internal temp of meatballs is 165 degrees F.
Always add about 1/4 cup water to the jar of sauce, put the lid on, shake and then add to ensure you get all the sauce out of the jar! Easy enough, right? The hemp or seeds are optional but add a nice little nutritional boost and you can’t taste them. The carrots and peppers should get nice and sauce and pretty much blend into the sauce. Neither of my kids notice the mushrooms in these. I make 12-16 meatballs but you can make yours whatever size you want. Just keep in mind that smaller will cook faster and you want them all to be similarly sized so they cook evenly. If you like meatballs like we do, be sure to also check out these Paleo Turkey Sweet Potato Meatballs and these Thai Chicken Meatballs. YES. Pinning and making them. I love recipes with ground beef! Can you use almond meal in place of the bread crumbs? If no, is there a different substitute? Yum this does look super easy! I love crockpot meals! I bet you could use Italian style breadcrumbs and not add the spices, but it probably has more salt that way, right? i bet the salt would be about the same. would depend on the breadcrumbs…some can be loaded with sodium. I remember making something like this for a work get together. I love how easy, most crockpot recipes are. Thanks for sharing this Lindsay! Every mom loves a good crockpot recipe. Anything to make dinner easier. 🙂 I’ve never tried meatballs in the crockpot–that totally needs to change. I’m always looking for a good crockpot meal. Yum! Yay, and just in time for meatball season! Love this warm and wonderful idea – pinning for some crockpot deliciousness! LOVE the hemp seeds added into these! I make a lot of turkey balls – but NEVER ever thought of adding hemp seeds to them – what an awesome nutritional boost! yes! and so easy to toss in there! Yayy! 😀 Crockpot recipes + protein! Probably my favorite combination, hehehe. I love crockpot recipes, and I have a feeling once the babies arrive, my crockpot will be on overdrive! 😉 These meatballs sound great! Do you think they would work well with ground turkey meat instead of beef? I love meatballs and I love crock pot recipes. Done and done! 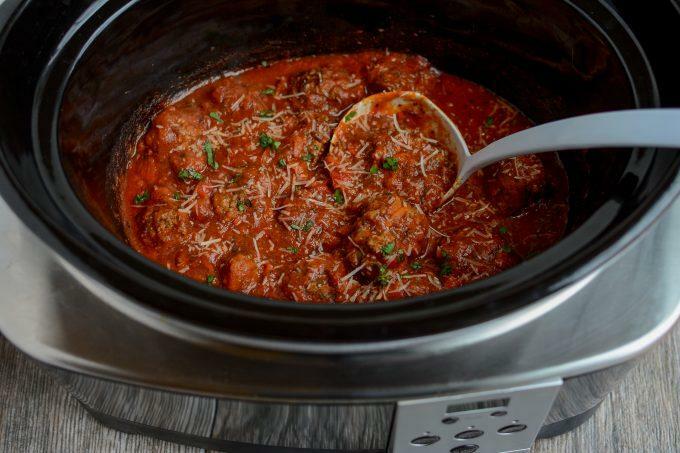 Crock pot recipes are genius – LOVE any way to save time, haha! me too 🙂 love mine so much! I so need a crock pot!!! Love the recipe! definitely one of my favorite kitchen appliances! Hey Lindsay! Thanks for the recipe! I’ve been wanting to use crock pot more…but recently am trying out the meatless ways…oh dear haha. Thanks for caring what we want to read! lots of great meatless crockpot recipes out there too! Meatballs are weirdly one of my favorite foods. I can’t wait to make these! I’ve been relying more on the crockpot lately since I’m out 9 am to 10 pm on a lot of days of the week this month. it can be a lifesaver! Yep, definitely making these. If I’m subbing gluten free breadcrumbs do you think gf panko would be okay or should I find another gf breadcrumb option? this is a great recipe i will sub beef with turkey though. I love sneaking hempseeds into meals…what a great idea! thanks! i’m getting better at adding them to more things! I still haven’t started using the crockpot in my apartment yet! This looks like the perfect recipe to break it in! 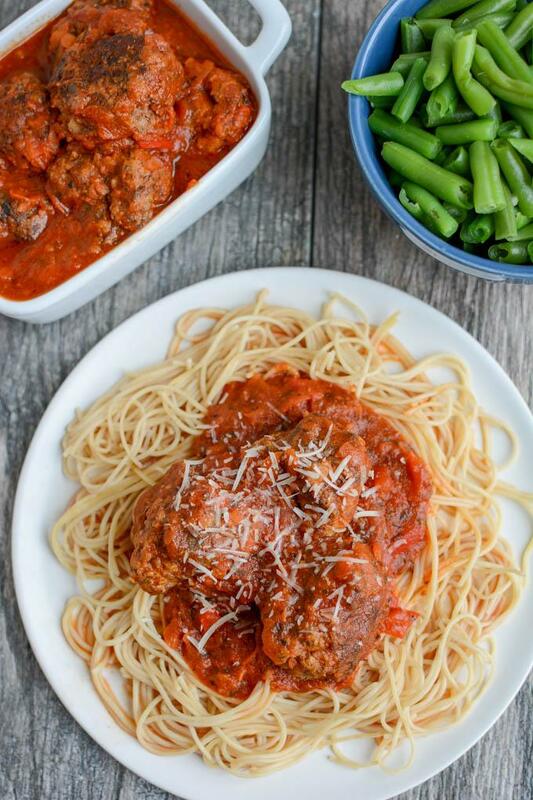 YES to crockpots and YES to meatballs. Why have I never thought to make meatballs in the crockpot!?! Genius! I just pinned these… I try so hard at making meatballs and usually fail! Hope these work out for you! Finally made these’ and were awesome, got the 3 year old seal of approval. The meatballs were almost eaten in one night! Cooked some lentils in th extra sauce to make it stretch! Can I used fresh tomatoes? How many? Also what do you do with the carrots? I don’t see them in the instructions. I would not sub fresh tomatoes by themselves. You could sub a sauce made with fresh tomatoes. Carrots should be stirred in with the sauce.